Spring has arrived and we couldn’t be happier! Winter lasts forever here in Ohio, so every year, we impatiently wait for warmer temps, birds chirping and blooming flowers. Luckily, Florida’s spring temps usually show up in late February/early March which gives us a great reason to escape to Walt Disney World and experience the Flower and Garden Festival, all while enjoying sunshine, violet lemonade and all the beautiful colors of spring. 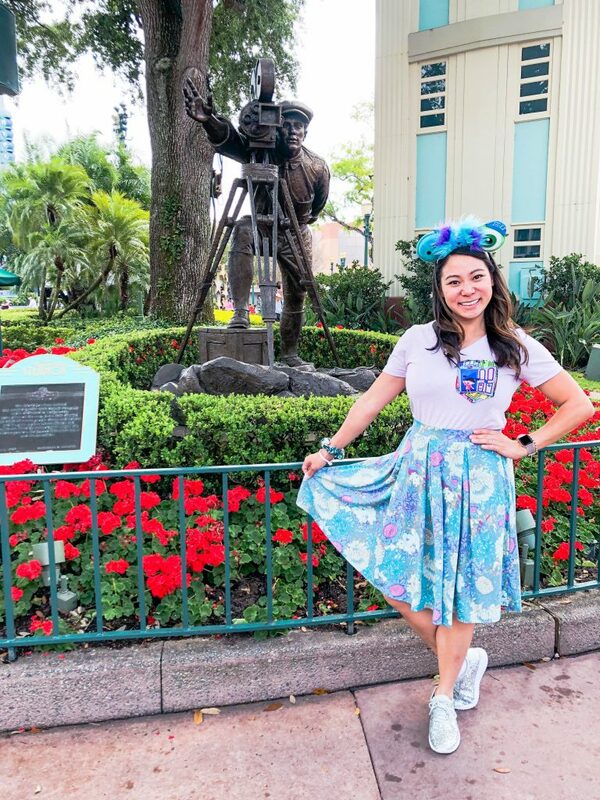 Annual trips to Disney in the spring have become a pretty regular thing for us since becoming Passholders and every year we always find ourselves asking, what should we wear to the Parks?! Luckily, these days we have Instagram to turn to for inspiration for our Spring Park looks, and have gathered up a few of our Instafriends to help show off some of their fun and comfy outfits for Spring. We love that all of these could be worn outside of the Parks(sans ears maybe?) for a casual nod to Disney magic. While we are just breaking into 50 degree temps up north, Orlando is already getting hot, with average temps in the 80s, which means you’ll want something cool and comfortable. If you’re headed to Disneyland on the other hand, SoCal hasn’t quite reached “hot” yet and doesn’t generally come with the obscene humidity that Orlando is known for, so some light layering may be your best friend if you’re visiting the West Coast this spring. 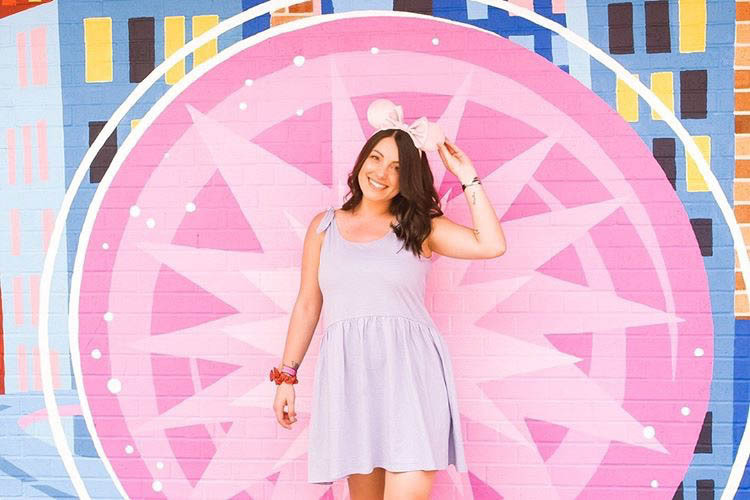 Our friend Kristen @neverlandandmagic is the princess of pastels and you can tell as soon as you look at her pink hued feed. So we absolutely love this simple yet beautiful outfit she created with a pastel purple dress from Asos and millennial pink ears from ItsAEarWorld. Comfortable, light and perfect for throwing a jean jacket over if it gets too chilly, this spring look gives us all the heart eyes. 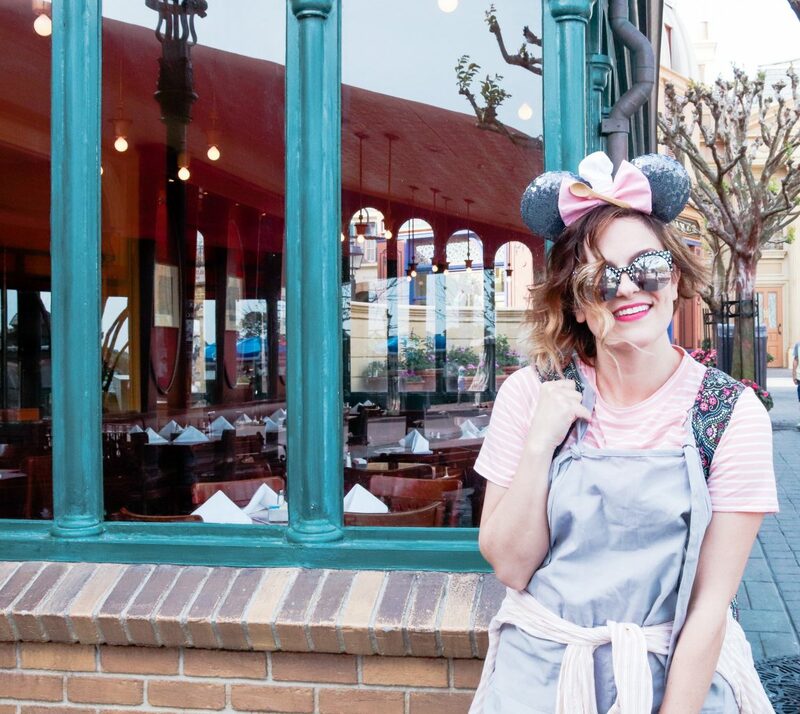 There’s not much we love more than seeing a good Disneybound, that is simple yet effective. Amanda from @simply.magical.life has created just that and we think the results are just swoonworthy. 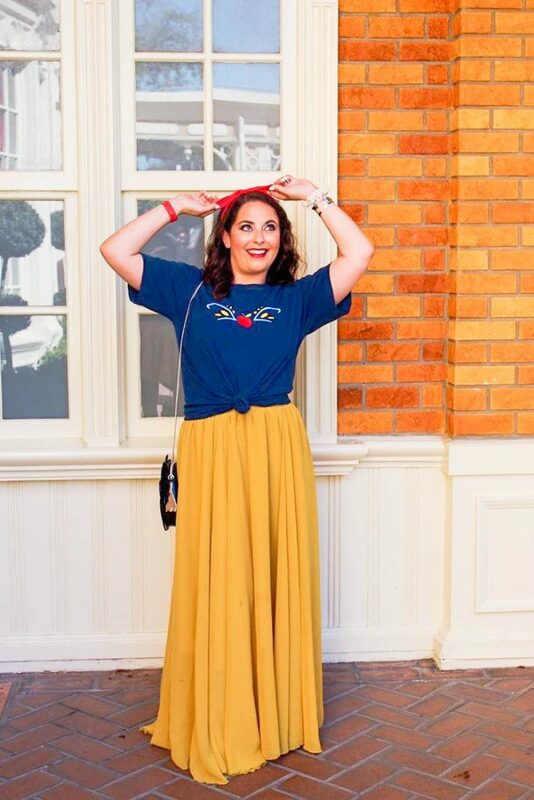 Pairing a small shop tee from Stewart Avenue with a long flowy skirt from Amazon, red bowband from Main Street Tilly Ears and Snow White purse from Danielle Nicole, this perfect Snow White bound is pure magic. We love that all of these pieces could be used in other outfits too, making this a super versatile look. Nothing is more classic than a Mickey inspired outfit. 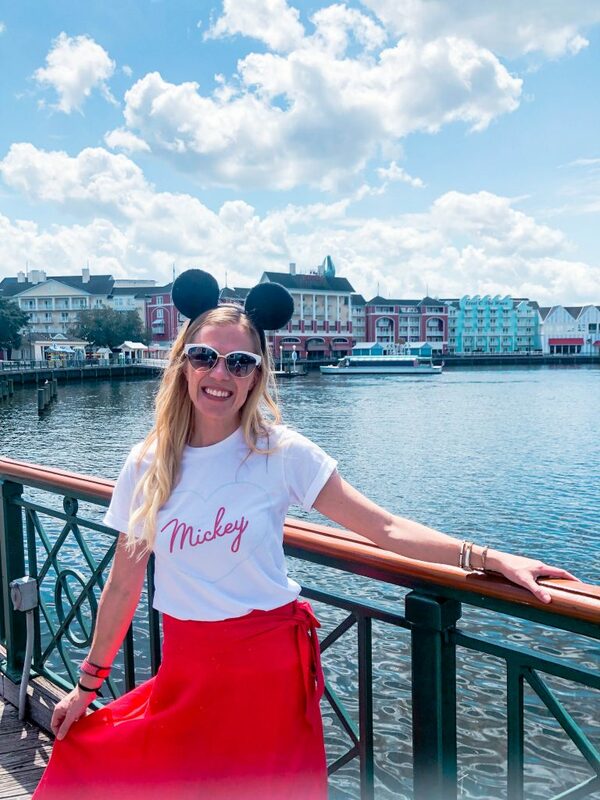 Kelly from @mickeybarmama knows how to create fun, casual, practical outfits for the Parks and we love her take on Mickey style here! 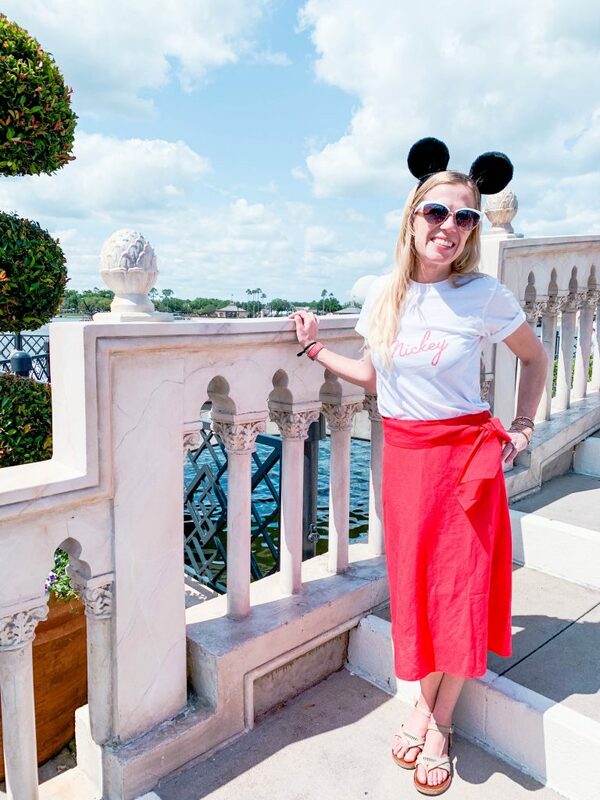 With classic Mickey ears from the Parks, a simple graphic tee from Next Stop Main Street and a red skirt from Loft, this look is as cute as it is comfy, perfect for busy park days. If there is one thing we love about Tina from @diaryofadisneymom, it’s that she knows comfort is essential when planning trips to the Parks. 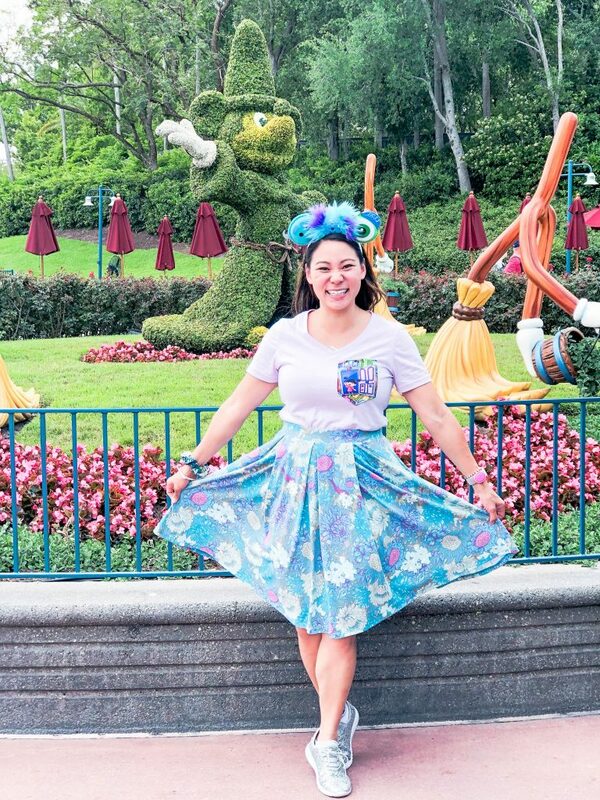 Not only is she great at finding comfy outfits for the Parks, she loves a good theme as much as we do. So when she visited Sulley and Mike at Hollywood Studios, she created a super fun take on Monsters Inc character themed outfit. Complete with comfy tennis shoes perfect for long days at the Parks, we love that each of these pieces can be worn separately to create more fun outfits inside and outside the Parks. With a tee from Woolly Llama Creations,skirt from Lularoe, and ears from Blooming Pops, we love this bright and colorful outfit for spring! We have recently fallen in love with rompers. They’re comfy, breathable and are so easy to style, giving you a put together look without a whole lot of effort. 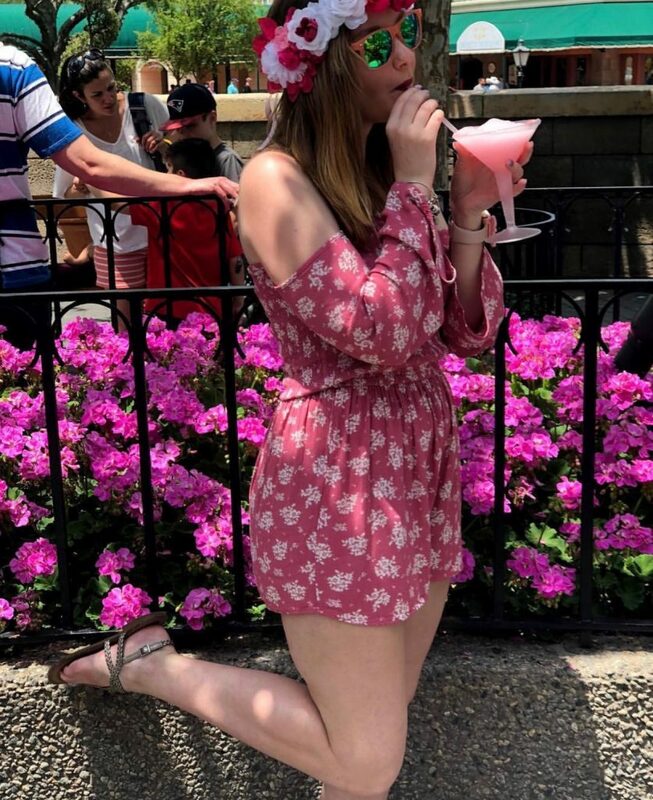 We love pinks and florals for spring and how @cinder.alyy paired it with a beautiful pink flower crown, and pink sunnies making it a beautiful look inside and outside of the Parks. Her romper is from Butler & Co, who no longer sells this romper but you can find a similar one here. 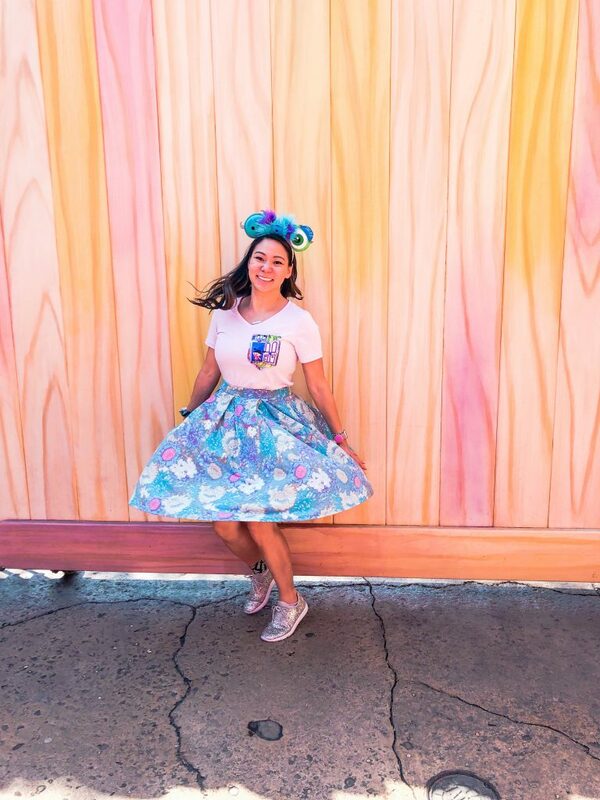 One thing we love about @jessjets2disney is that she is not afraid to have fun and be bold with her style. And with classic Mickey colors, how can you go wrong? 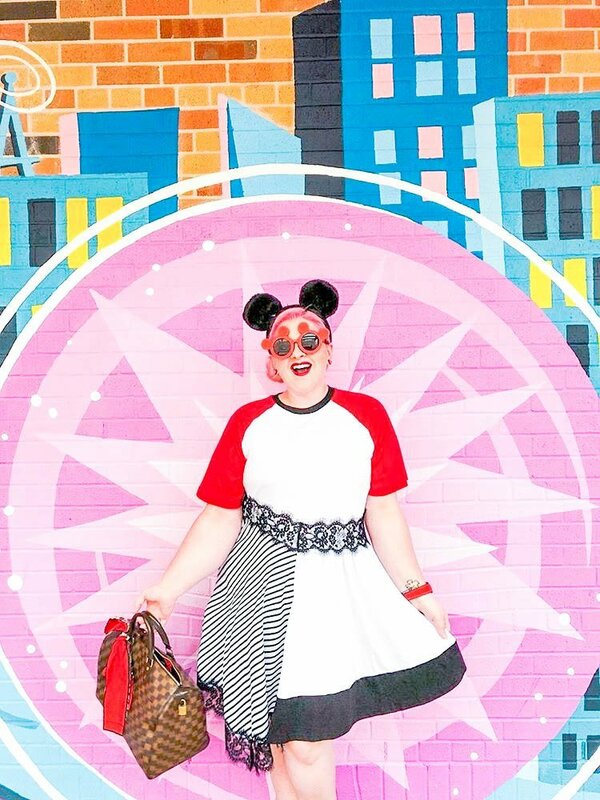 With a super fun dress from Asos, Mickey sunnies from Magic Shoppe Ears and classic Mickey ears, we love this creative take on Mickey style. 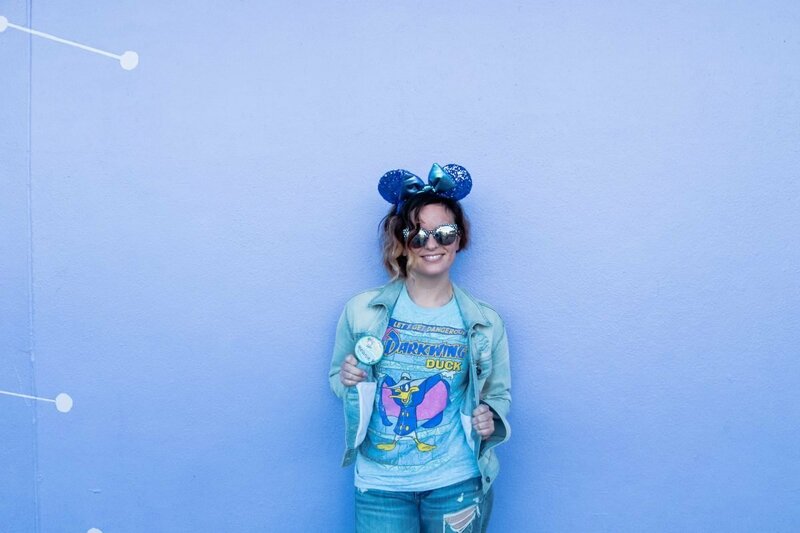 Our friend Bee, @ragingfordisney has some pretty epic style both in and outside the Parks. 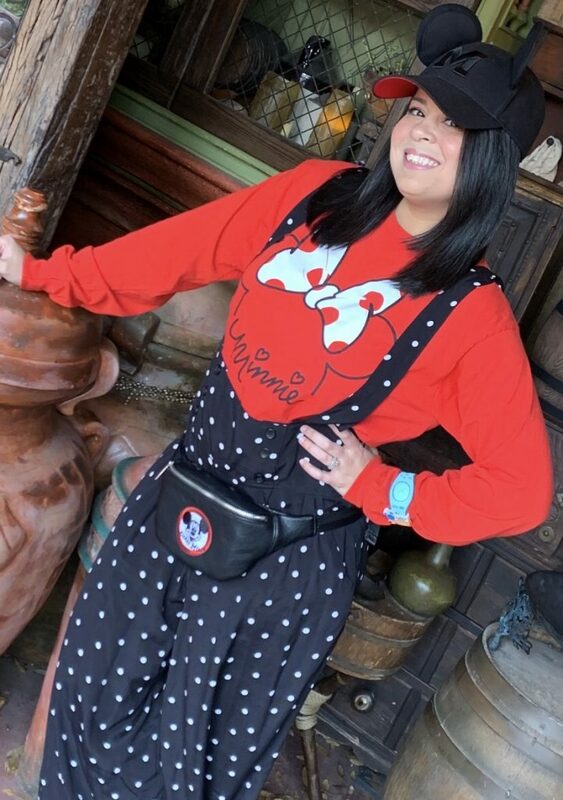 And she can rock polkadots like it’s her job, so we love that she paired her polkadot suspender pants with a Minnie tee and hat to keep the harsh Orlando sun at bay. Overall, I’d say overalls might be my favorite trend right now(you should have seen a pun coming somewhere in this post). And I have found my very favorite pair of overalls from Amazon. I love these because they are light, breezy, oversized and extremely comfortable. I actually have them in several colors because they are one of my favorite things to wear to the Parks and I get asked about them every time I wear them. For this outfit, I paired them with a pink striped tee and ears from Oops A Daisy Ears for a Remy bound, but have also worn them for an Eeyore Bound and a graphic tee for a few different looks, making them super versatile. So there you have it, some of our favorite looks for spring. We were so lucky to have so many lovely ladies participate in this post and share their style with us. 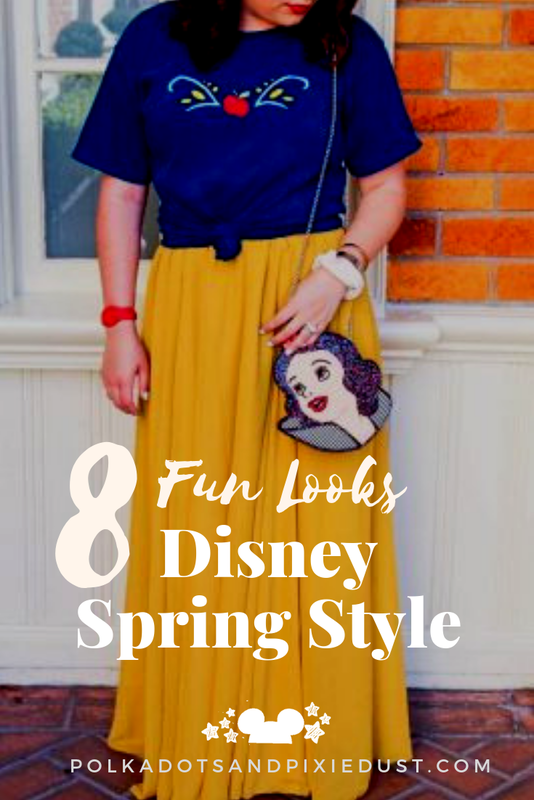 Hope this helped give you some inspiration for your Disney Style this spring!